Custom Built Upholstered Seating Areas. Chair and Sofa Repair & Reupholstery. Pub, Club and Restaurant Makeovers. Divano Upholstery is an independent furniture upholstery business based in Hemel Hempstead, Hertfordshire. We are highly skilled upholsterers with over 20 years of experience in the industry offering both domestic and commercial upholstery services to clients in the Hertfordshire area including Hemel Hempstead, St Albans, Watford, Rickmansworth, Harpenden, Hatfield, Borehamwood, Berkhamsted and surrounding areas. Reinvent your old, tired furniture with Divano Upholstery. Do you have a sofa, chair or stool that has seen better days? Perhaps you'd like us to give your antique chair a new lease of life? We can professionally reupholster furniture with any fabric that you may require. Call us on 07975 640671 or request a free upholstery quotation online. We offer a wide range of upholstery services from sofa recovering, furniture reupholstery and upholstery repair in the Hemel Hempstead area. If you are looking to give your pub, club, bar or restaurant seating a makeover call Divano Upholstery - Commercial reupholstery services. Contact us today to arrange your free, no obligation consultation - we offer expert advice & have imaginative ideas to help you choose. Why Choose Us For Upholstery in the Hemel Hempstead Area? 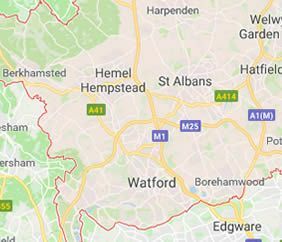 Looking for An Upholsterer in the Hemel Hempstead Area? Divano Upholstery are professional upholsterers based in Hemel Hempstead covering the Hertfordshire area including Hemel Hempstead, St Albans, Watford, Rickmansworth, Harpenden, Hatfield, Borehamwood, Berkhamsted and surrounding areas. We stock and supply a wide variety of foams and fabrics. Whatever your taste or budget we strive to give you outstanding quality and exceptional value. Our experienced craftsmen will be only too happy to offer you expert advice to help you make the right choices when choosing a new fabric.